This high-performance mixer leverages LTCC, semiconductor technology, and patented circuit techniques to achieve high frequency low-loss up conversion for instrumentation and military applications. Test instrumentation may need to accommodate signals having a wide-percentage frequency bandwidth. For ease of processing such IF signals, the input can be upconverted in order to reduce the percentage bandwidth. To facilitate up conversion, Mini-Circuits has developed a high-performance passive mixer that allows original-equipment manufacturers (OEMs) to optimize receiver design. Such mixers are also useful in military applications. Mini-Circuits' model SIM-U742MH+ mixer is based on a combination of low-temperature-co fired-ceramic (LTCC) technology, semiconductor technology, and a highly manufacturable circuit layout. The patented combination results in small size, high insensitivity to electrostatic discharge (ESD) and excellent stability with temperature. It is a part of growing family of SIM mixers. Instrumentation and military transmitters need components, such as mixers that provide stable performance over time and under different environmental conditions, including temperature. The SIM-U742MH+ mixer (Fig. 1) is built on a LTCC substrate, ideally suited for designs with multilayer circuits. In contrast to conventional planar circuit designs, in which all circuit elements are placed on one side of a single-layer printed circuit board, LTCC circuits can be designed and fabricated in three dimensions, even with embedded components between layers, to save space. The approach results in a mixer that measures just 0.2 x 0.18 x 0.087 in. (5.1 x 4.6 x 2.2 mm), which is smaller than some commercial semiconductor-based mixers. While the SIM-U742MH+ mixer incorporates semiconductors to accomplish its frequency-translation function, it is a passive design that operates without DC bias (compared to a standard integrated-circuit mixer which requires the application of constant DC bias). Figure 1. The SIM-U742MH+ surface-mount mixer is ideal for upconverting signals in the 0.1-3300 MHz band to the higher 2300-7400 MHz band. The SIM-U742MH+ is a double-balanced mixer (Fig. 2) built around a reliable diode quad. Except for the diodes, the entire structure is implemented in multiple layers of LTCC which is inherently hermetic. By integrating components in LTCC, the mass of the mixer is minimized, making it extremely rugged in terms of withstanding mechanical shock and vibration. In fact, the entire mixer structure can withstand the environmental extremes usually associated with tough military components, regarding temperature, humidity, vibration, and mechanical shock. Figure 2. The SIM-U742MH+ double-balanced mixer employs a diode quad with patented circuit techniques and proven LTCC circuit materials for stable, high-ESD-immunity performance. The mixer is RoHS compliant, constructed without lead-based solder or other hazardous materials. It is also built to withstand severe ESD scenarios under conditions normally hazardous to monolithic semiconductor mixers. The SIM-U742MH+, like other members of the company’s SIM mixer line, meets Class 1C ESD requirements: a level of 1000 V when tested per the Human Body Model (HBM), compared to standard semiconductor mixers which are typically rated as Class 1A, 250 V for HBM testing. The SIM-U742MH+ mixer also meets Class M2 ESD requirements (testing at 100 V) according to the ESD Machine Model. 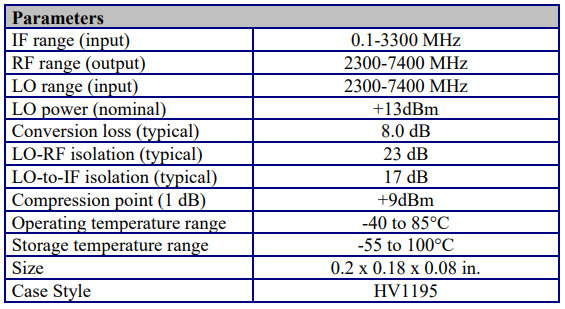 Table 1: Performance characteristics of the SIM-U742MH+ mixer. The SIM-U742MH+ mixer accepts intermediate-frequency (IF) signals from near 0.1 to 3300 MHz and local-oscillator (LO) signals from 2300 to 7400 MHz and a nominal LO level of +13 dBm to produce RF output signals from 2300 to 7400 MHz. It performs the frequency upconversion with typical conversion loss of 8.0 dB. The mixer's conversion loss increases with IF frequency. See Fig. 3, which shows test results with LO drive levels of +10, +13, and +16 dBm. 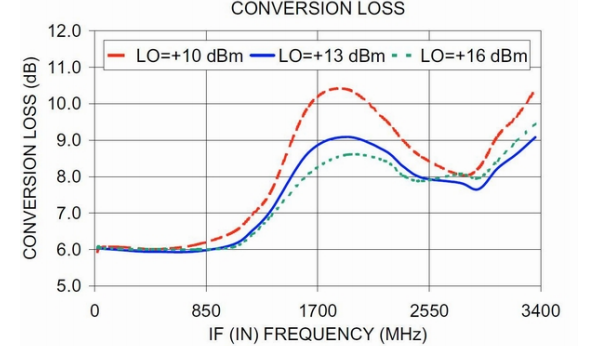 The variation of conversion loss with LO drive power is typically +1.0 /-0.5 dB across the 3300-MHz measured bandwidth. Figure 3. The SIM-U742MH+ mixer exhibits low conversion loss to 850 MHz IF and medium loss to 3300 MHz tested at LO drive levels of +10, +13, and +16 dBm. 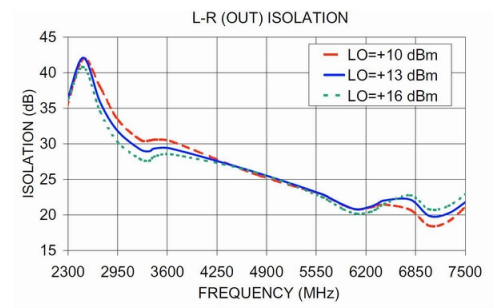 The LO-to-RF isolation of the SIM-U742MH+ mixer was evaluated at the three LO drive levels used in the conversion-loss test, to understand the effect of variation in LO power on isolation. As Fig. 4 shows, the LO-to-RF isolation is high; 42 dB at 2500 MHz and 22 dB at 7400 MHz. Variation in isolation as a function of LO power is negligible. Similarly, the LO-to-IF port isolation was also evaluated at the three LO drive levels. The SIM-U742MH+ mixer exhibited typically 17 dB isolation across an LO frequency range of 2300 to 7400 MHz (Fig. 5). Figure 5. The isolation between the LO and IF ports was measured as typically 17 dB at three LO drive levels of +10, +13, and +16 dBm across the full frequency range of the SIM-U742MH+ mixer. Since wide dynamic range is important in instrumentation applications, the input third-order intercept point (IIP3) of the SIM-U742MH+ mixer was evaluated at the three LO drive levels (+10, +13, and +16 dBm) and IF input to 3300 MHz. 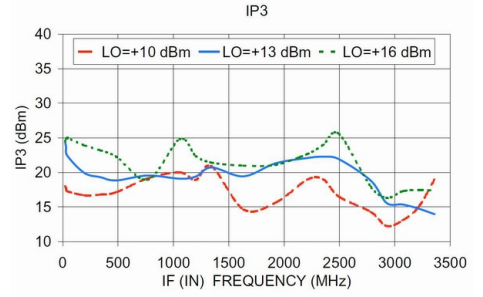 IP3 is consistently about +20 dBm up to 2700 MHz and then decreases to +14 dBm at 3300 MHz (Fig. 6). Figure 6. The measured input third-order intercept performance of the SIM-U742MH+ mixer is typically +20 dBm at all frequencies, at LO = +13 dBm and higher. This LTCC double-balanced mixer features typical LO port VSWR of 1.6:1 to 6:1. The VSWR measured at the RF port is 3:1 typical, while the VSWR at the IF port is typically 1.5:1. The SIM-U742MH+ mixer supports conventional surface-mount applications, and can be supplied in tape-and-reel formats for use with automated assembly equipment. This RoHS-compliant mixer is designed to withstand high levels of ESD mishandling compared to more sensitive, and often larger, semiconductor mixers. Mini-Circuits’ LTCC mixers have been tested extensively and qualified for environmental conditions such as humidity, thermal shock, and vibration. To evaluate the durability and reliability of their solder joints, 20 of the LTCC mixers were soldered onto FR-4 PCB motherboards and thermally cycled (1000 cycles) over the operating temperature range of -40 to 85ºC. The DC continuity was measured from the motherboard trace to the top of the LTCC board, with no failures found.